Anything can happen at summer camp — including emergencies. 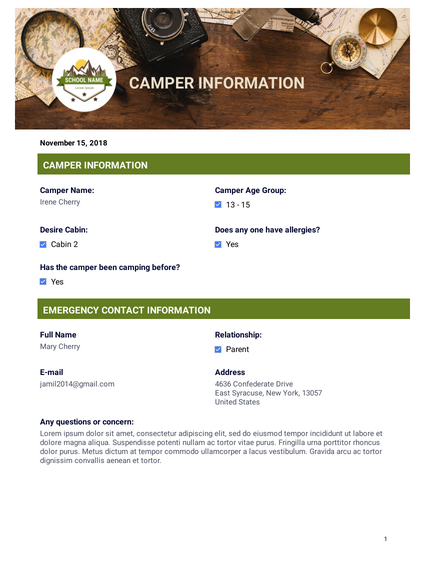 No matter how prepared your camp staff is, there may be an accident that requires you to call a camper’s emergency contacts. You can use this professionally designed Emergency Contact PDF Template to collect the necessary information. With JotForm’s PDF Editor, you can easily add more form fields if you’d like multiple emergency contact numbers and prior authorization for emergency medical treatment. JotForm will convert all submitted information into PDFs that can easily be downloaded, distributed, and accessed on any device during an emergency so your staff can contact the right people immediately.